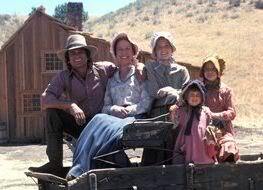 Even though this episode didn’t center around the Ingalls, I did enjoy it. 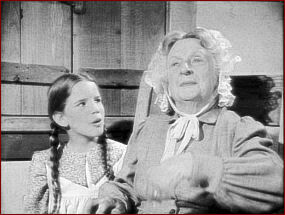 I liked Maddie, the old lady in the beginning scene who has the girls singing. It sounds like she called Laura “Laure” lol I think this episode is sort of like a lesson or reminder to us all that we should keep in touch w/ our family members because it’s true that we all get really busy with our lives and we tend to forget our friends/family. Just the other day I got a call from a friend who said… “Well, I just wanted to call and check up on you, to see if you’re still alive” lol I guess that was a sign I had kind of forgotten her. :shy: Anyway, this episode has several funny scenes. One I can point out is when Laura and Mary are in bed and Laura keeps talking to Mary who keeps telling her to go to sleep. Then Laura says that when you die, death must be like that, and then she says to Mary: “Goodnight!” and Mary is just left there staring w/ her eyes open, afraid to sleep now. This was a good episode..I really like how she conned Pa into helping her out, Ma got mad, but ended up helping her too! The comic aspect of it was hilarious. Like the scenes you mentioned, Larry. It was funny; Ma was going to talk her out of it and next thing you know, she said she agreed to make a cake! Everyone running around like mad; Pa sprinting from the barn to the house when he saw the preacher coming. Very funny! This is another great episode. I thought it was sad, how Miss Amy had to stage her death, just so she could see her kids. I loved this episode. It is sad that a woman has to stage her own death to see her children and grandchildren, but it's true that sometimes this is what it takes to get people to come to you. It was so funny how Doc Baker, Charles and Caroline all protested but ended up staging the whole thing with her. 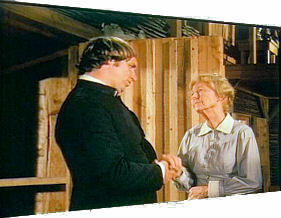 I would have loved to have seen what would have happened if Reverend Alden had been brought into the con. That feisty little tirade of Amy's at the end where she gives her children what for is the best part. This is a cute episode and sad too. I hate how Miss Maddie dies in her rocking chair while reading the letter from her kids that they aren't coming in for her birthday, and how Miss Amy gets the idea to make sure her kids come see her.......The whole scene that has been mentioned with Doc Baker and Charles getting talked into helping Miss Amy stage her own death and Caroline protesting so loud about it and then giving in to help is so classic. I enjoyed this episode. That's what I got from it too, that it's important to keep in touch with those you care about. 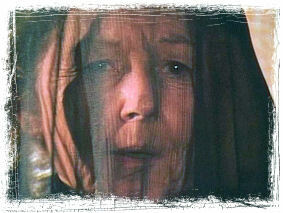 Also, i thought it was funny when Miss Amy takes her veil off at the party and the Father says "Oh! That's Ms. OHara... Hi Ms. O'Hara" LOL!!! This is a good episode that is both sad and funny. It is sad that it takes a death for the children to come. I enjoy all the scenes already mentioned, plus the scene in the Ingalls' house when the priest comes. They are trying so hard not to lie about anything! I loved this episode, in fact one of my favorites. It really had all the elements...you're chuckling one minute and then sad the next. The end actually makes me cry, and I don't cry easily! I loved the part when she's found out by Charles and the Doc and they get so angry with her! The woman who played Amy was just fabulous. It always amazed me how Little House cast such elderly people so freely. You just don't see that done anymore, I don't think. Although it's not really a favourite episode of mine it does have some funny and good parts. 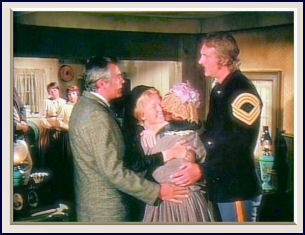 Ingalls house for Laura, Mary and Carrie and they are singing songs with each other. I like the part were Amy is fooling Charles & Doc Baker. Pretending she is sick and asking Doc and Charles to arrange the funeral etc. Then when they promised, she got out of bed! I love Charles and Doc's reactions. They are very angry, but finally they agree with the idea . I like Caroline's reaction too! Being angry with Charles because he promised Amy to arrange her funeral. She would talk Amy out of this idea. It's so cute when Charles and Carrie are outside waiting for Caroline who is inside the house talking to Amy. Charles is walking back and forth next to the wagon, and Carrie who is in the wagen walks with him. So cute ! I love Caroline her face expression when she comes out of the house. Charles thinks Caroline managed to talk Amy out of this idea and asks her how she did that. Then Caroline says: "I'm baking the cake!" I thought it was a nice ending with the wake and Amy finally got to see her children and grandchildren. She was very angry with them at first and then her children realize that it was wrong of them that they didn't visited their mother in a long time. I thought it was nice she was finally reunited with her children. I love the part were Charles starts to play the violin. It was funny how Doc Baker was so nervous during the whole wake! Then Charles says to him: "Doc you got my permission to dance with my wife." It's a nice episode. And I like the lesson we can learn from it! I love this one too! Amy is too funny, and such a sweet lady. All she really wants is to be with the ones she loves and she'll go to any length to see them again. Some of my favorite scenes are the ones already mentioned - Doc Baker is too funny when he's so nervous at the wake! And also, when Amy talks to the priest outside, Charles rips off a piece of the cake, convinced "they don't need it anymore". Little did he know! LOL. I like this episode, but I thought that it was said that Amy had to pretend to be dead so she could see her children again. I have to laugh when Maddie is playing the autoharp! Sometimes she doesn't even hit the strings. 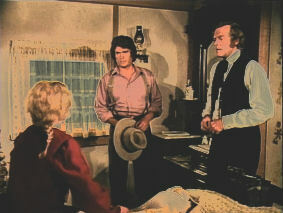 I love it when Pa is pacing by the wagon and Carrie starts copying him! I'm late chiming in, but this is one of my *favorite* episodes. All of you have mentioned my favorite moments. I loved how angry Doc & Charles got at Amy when they found out that she wasn't actually ill at all. Their reaction was so funny! Caroline looked so sure that she was going to be able to dissuade Amy from her notion - and instead ends up persuaded by Amy to bake the cake! And little Carrie copying Pa in the wagon! That was so cute! There were so many funny moments. Definitely one of my favorites. This is actually one of my favorite episodes. I like episodes like this and The Craftsman, where the story isn't completely centered around the Ingalls, there is an outside character, and where something valuable is learned. People tend to push important things off saying "i'll do it tomorrow"....but tomorrow may be too late. I really liked her too. I loved how she convinced everyone, even stubborn Caroline haha, to fake the funeral and all. I just watched this last night. Everybody in my family loves this one! It is SOO funny!! It is kinda sad, because Amy does have a point in what she does with her kids never coming to see her, and not even hearing from the youngest in 15 years. This isn't one of my favorite episodes... it has it's moments though! My favorite parts would be when Ma goes in to set Amy straight and Pa and Carrie are outside. I love the pacing and how Carrie is imitating Pa. That's really cute. Then Ma comes out and she doesn't say anything. Charles asks how it went. "I'm making the cake." Silence and then Charles begins to giggle. After school Laura goes to Doc Baker and tells sneakily tells him about Amy and Nels is clueless! I feel sorry for the umm... priest?. "Hey, that's Miss O'Hara!" I love the opening scene, when they are singing. This is a great episode! It reminded me of my family. Most of my aunts kept up with my granny, but two of them didnt show up until she was on her deathbed. I will always love this episode because ,even though this episode was about death, it was so funny! I don't really like this esp.It's too sad...I think what the lady does is very selfish thing.I mean i can understand the reason behind why she does it tho.I mean i understand it..I don't think it's right tho. Love the Irish accents, and Thelma Lou! This one is not one of my favorites. I understand why Miss Amy does it, but it still is not something that I think she should have done. 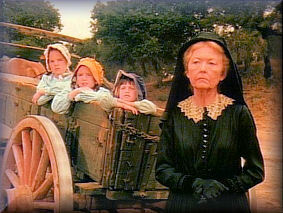 I wish that there was another way the Ingalls' family helped her to gather her children and grandchildren around her. I agree with you.I understand too.I just think it's NOT right of her todo. This was a very strange episode, but it has some really great scenes in it. 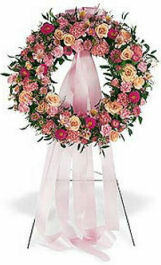 I am not sure if Laura ever realized that the reason that Miss Amy thought up the whole idea to pretend that she died in order to see her family again was because at her friend's funeral, Laura made the comment that we should have our funerals before we die, that way we would be able to see our family again. I love the scene when Caroline is in a frenzy because Charles got roped into going along with Miss Amy's plan of feigning death.... especially when they go to her house and Caroline tries to talk sense into her. While she is inside, Charles is pacing back and forth next to the wagon... And Carrie is imitating his every move! Then Caroline comes back and doesn't say anything. Charles asks her how it went.. and she replies and says "I'm making the cake". I love Charles smile and laugh when she said that! It was also nice to see the three new, deleted scenes as well. I really like the one when Laura runs to tell Caroline and Miss Amy that her family was there. That whole scene with Laura right there was deleted on the older DVDs. This is a weird episode. I was watching it again, last night. I don't remember being on tv, when I was a child. I remember the pilot episode or the girls going to school. But, this episode. I don't remember being on tv as rerun back in the 80's. Subject: Re: "IF I SHOULD WAKE BEFORE I DIE"